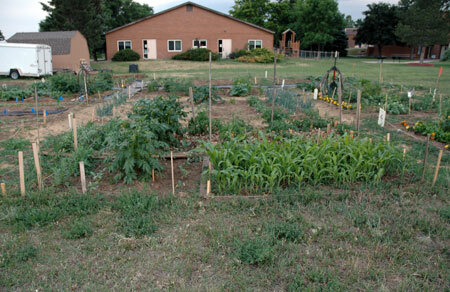 Our community garden is really looking like a garden these days! In the warmth of the June sun (and with the help of a little organic fish emulsion), the plants are really reaching for the sky. 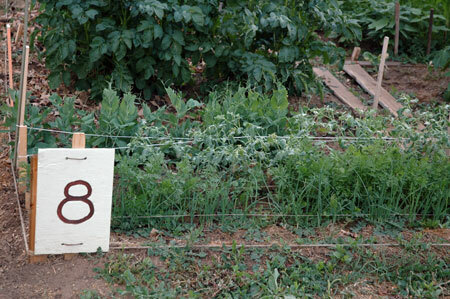 I finally remembered to bring the camera along to take some photos of our plots’ progress. 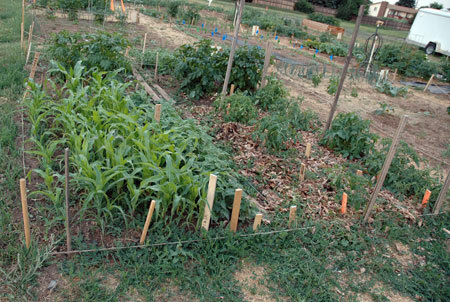 This long-shot mostly shows off our rows of sweet corn and huge potato plants. This photo shows, from front to back, our rows of leeks and purple carrots (both in desperate need of thinning), a row of chickpeas (the chickpeas themselves were purchased dry for cooking from Rancho Gordo), a row of peas, a row of beets (hidden behind the peas), and two red potato plants. You can also see all the robust weeds we have been growing; this has been more of a problem than I expected for the first year. 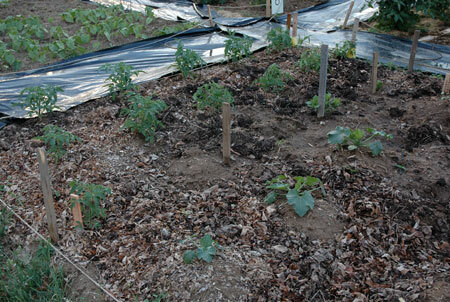 I am very excited to see what happens in this row—the plants coming up are purple hull peas, saved from last year. We got 5 plants in the first sowing, but after replanting in the gaps, more are coming up and seem to be thriving. I will be thrilled if we actually get some purple hull peas from this crop, since I doubt they will be for sale around here. Moving around, next to the corn, we planted Rio Zape beans from Rancho Gordo; the quadrant next to that is full of tomatoes grown from seed, mostly heirloom varieties I saved last year. So far we have two of the yellow heirloom tomato plants starting to blossom. 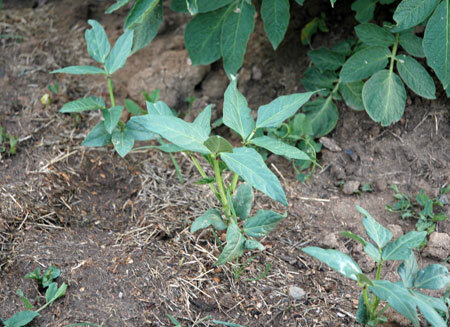 Near the end of the cut-off date for reserving rentals, we decided to snap up one of the plots that had not yet been claimed, so these plants have all bee in place for two weeks or less. My dad went crazy and put in several more rows of tomato plants. You can also see several zucchinis we started indoors; next to them are mounds of delicata squash and honeydew melon we sowed directly from seed, hopefully not too late to bear fruit. When we saw how well the red and Yukon gold potatoes were doing in our first plot, I decided to be adventurous and plant a few purple potatoes that were sprouting on the basement steps anyway. They look fine so far… I guess time will tell if we get a crop of pretty purple potatoes from them or not. 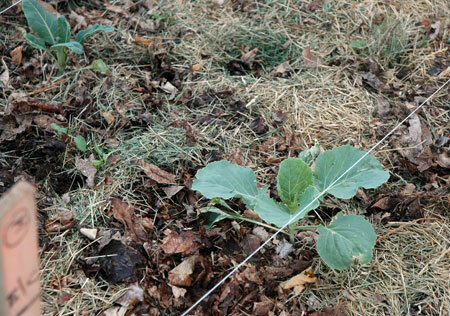 We also planted several rows of brassicas in this plot: Brussels sprouts and cabbages transplanted from indoor starts, and extra cauliflowers transplanted from our first plot. 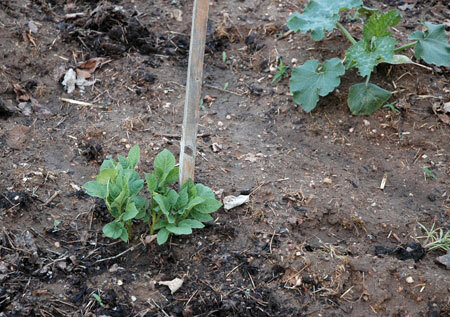 Many of the transplants wilted somewhat in the heat, but most survived, and we filled in the gaps with more seed, some of which is just starting to come up. 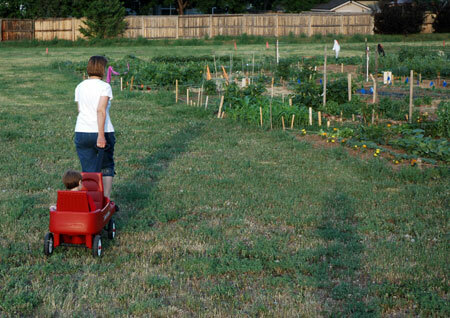 I have been so lucky to have a community garden within walking distance both in Oregon and in Colorado. The fledgling garden here shows great promise, and I am pleased to be on its steering committee as we expand the community vision and the physical space of this garden in times to come.